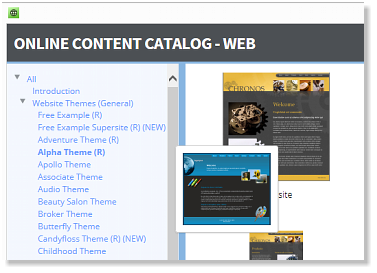 The Content Catalog is resizable, has big thumbnails of all the contents and is easier for viewing and selecting. When you have a website or presentation theme open, moving the cursor over the blue listings on the left side produces a small pop-up thumbnail to help quickly preview the different styles and colors in each folder. If you are using the trial version, the templates displayed in blue on the the list are available for you to try now. The items shown in red are available for free, but only after you purchase Designer Pro X10. There is also a large set of Business Specific Website Themes. These are available for an additional price. (My photo of the balloons below is displayed in the Web Pack 2 > Hover Widgets folder, one of several dozen photo widgets). SmartShapes are common vector shapes that have extra controls that let you modify them in ways that would take a lot longer if you had to start from scratch. The arrow shown below is a good example. On the next page we’ll see some more examples of SmartShapes that can be modified at any time. Tomorrow or next year. Any time. That’s what I call smart. 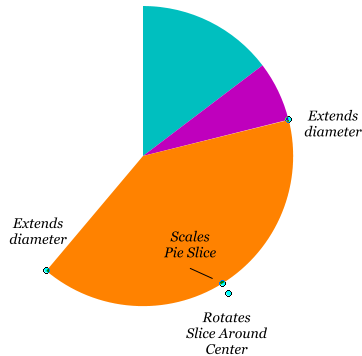 The pie chart shown here was created using a Pie Segment SmartShape. Cloning this shape allows you to quickly create a pie chart. 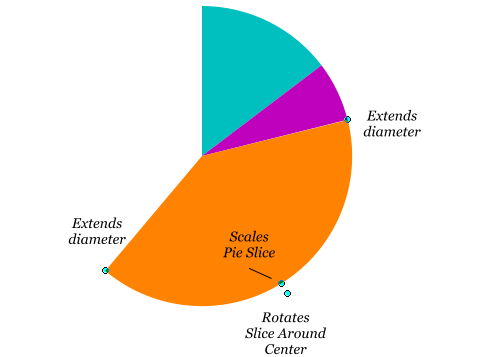 The small cyan circles are the control points and let you extend the diameter of the slice, scale the slice, and rotate the slice from the center of the pie circle. Each slice can be edited at any time. On the left is an elliptical SmartShape. 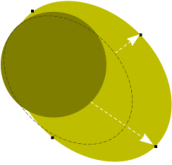 OK you ask, how smart can a simple ellipse be? Try doing this with a normal (dumb?) ellipse! If you’re bored and don’t have a tight deadline, as I do with this review, you can spend hours playing with all these smart shapes and you’ll marvel and how these things that are so simple can also be so smart! There are quite a lot of SmartShapes including expanding text bubbles, stickers, and a variety of geometric shapes. All with the same kind ease of use and flexibility.